Hematite derives its name from the Greek word haema for blood. Thinly sliced hematite is a reddish color and, when rubbed against a scratch plate, hematite leaves a red streak. While popular in antiquity as a protection against bleeding during the Egyptian era hematite was carved as seals for rings, as cameos for rings brooches and pendants, and for beads. It was used widely in the Victorian Era in mourning jewelry. Hematite continues to be popular today carved as intaglios for rings and strung as beads. 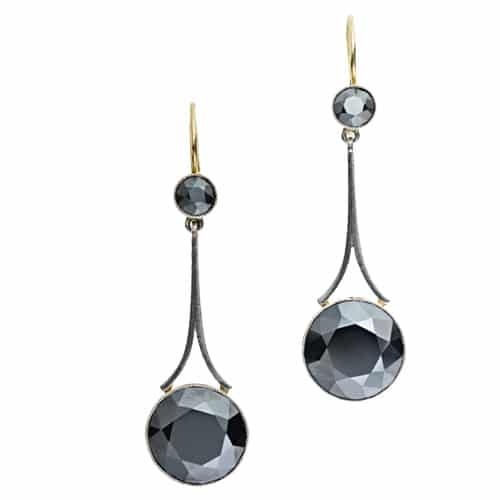 Hematite Earrings – a Perfect Example of Metallic Luster. Gem Reference Guide, Los Angeles: Gemological Institute of America, 1988. Pp. 134-135. Newman, Harold. An Illustrated Dictionary of Jewelry, New York: Thames and Hudson, 1981. Pp. 154. Schumann, Walter. Gemstones of the World, New York: Sterling Publishing, Co., 1977. Pp. 162.